To mark the opening of the 9/11 Memorial in Manhattan we are re-running an interview with Henry Singer, who in 2006 produced and directed The Falling Man, a 90 minute documentary for Channel 4 Television in the UK. The film was screened in over 30 countries and was nominated for an International Emmy in 2006. It tells the story of this controversial image: who took it; how it was first published and censored; the responses of the families, and the search to discover the identity of the man in the photograph. It was based on an article by Tom Junod that appeared in Esquire Magazine on September 2003. The article was nominated for a National Magazine Award. The following is an interview with Henry Singer. It took place on September 4, 2011. It has been condensed and edited. The interview was originally published September 11, 2011 on Design Observer. 9/11 was the most photographed and videotaped day in history. Out of all of these images why is The Falling Man so memorable? What is extraordinary beyond the graphic composition of this image — the parallel lines, the light on one of the towers — is the fact that the Falling Man, as he has come to be known, looks so composed. It’s the most horrific moment but there is a calmness to the image. And I think this is one of the reasons why it is so memorable. It captures the last moments of somebody’s life but it does so in a way that is peaceful and beautiful at the same time. That is one of the many reasons why it has burned itself into the consciousness of anybody who has looked at it. AHL: Why did you make a film about this particular photograph? HS: Because it essentially disappeared. It ran in many newspapers on the day after 9/11. In the film we go to a newspaper called the Morning Call in Allentown Pennsylvania. In the film, the photo editor, Naomi Halperin, talks about how striking the image was. There were so many images coming across the wire that day but this one stood out for her because it encapsulated the horror of the day. And yet at that paper, and across the country, there was an outcry from the readership saying how could you publish an image like this? This is offensive, our children could have looked at it, and a result the image basically disappeared from sight. It became a charged image very quickly and it disappeared from sight very quickly. One of the questions the film asks is why did the image disappear? What was it about this image that Americans found so distasteful? There was a kind of censorship that played itself out across the country and that made it an interesting topic for a film. AHL: Do you think it’s important to look at this image now? HS: I think it’s crucial to look at the image. I remember going to see the president of NBC news to see if he would be a potential contributor in the film. I was in the UK on 9/11, where I live, and I watched the BBC coverage. On the BBC you did see people falling before the towers came down. American networks didn’t show this. And I was curious to ask the NBC executive why not? And he said they didn’t want to subject their audience to that. But I think to really understand the horror of that day you have to include that kind of imagery. Its similar to showing caskets of soldiers who have died in Iraq and Afghanistan. You can’t turn away. The only way we can understand the world — and part of the world is the horror of the world — is to be a witness to these images. AHL: The majority of the images in the days following the attack were of the first responders, especially the firemen. Those photographs seemed to overwhelm more complicated images like The Falling Man. HS: I think that’s true. A culture like the United States prides itself on triumph, on winning, on overcoming the odds, on the myth of the city on the hill. It’s a kind of culture — and I say this as someone who grew up in the States and who now lives in Europe — that has to find some form of triumph in the face of a horrific event. And that’s where the firefighters come in. I have to add that is what most cultures do in the face of a horrific event. I think its part of our nature as human beings to wrest redemption from any event like this. Otherwise it becomes impossible to bear. It is no question that the firefighters became the story that Americans told themselves. And as Tom Junod succinctly puts it in the film an image like the Falling Man, and the reality of the jumpers themselves, just didn’t fit that narrative. It’s very hard to frame them as something that is triumphant. AHL: But one of the interviewees, whose wife was probably a jumper, says that he admired the fact that she took control of her life and decided to jump — that he imagined it must have felt like flying. That’s a generous and accepting way to interpret her act and the image. The irony is that I don’t know how many people were in a position to make that conscious choice. If you look at some of the other photos from that day you’ll see that people are stacked up at those windows and there is no question that people would have slid out or were pushed out by mistake. Some people would have been blown out by the force of the explosion, other may have been overcome by smoke and run instinctively to get air. I always describe the photograph as someone who jumped or fell from the World Trade Center because we will never know exactly how many people actually took that conscious choice to jump off the ledge. AHL: Is it important of us to know the identity of the Falling Man? HS: I don’t think so. I completely understand the motivation in trying to identify who he was. Different kinds of truths would have emerged if we could have identified who he was. There is no question that when you look at it you are curious to know. And if we could with 100% accuracy identity who he was, the photograph would have a different story to tell, and not an invalid story. But because we can’t categorically identify the falling man he has come to represent something like the idea of the unknown soldier. And I think that is a good thing. I think it gives the image a potency it wouldn’t otherwise have. If we knew exactly who he was he would stand for that one person. But as we don’t he stands for many. Gwendolyn Briley, the sister of Jonathan Briley, who may have been the Falling Man, says at the end of the film something that I think summarizes what the film is about. She says that she hopes that we are not trying to figure out who he is but trying to figure out who we are. So I think of the image as a kind of mirror: you can learn so much about yourself and so much about the culture. It is clearly open to different interpretations — some see beauty, some see horror, some see both, some see suicide, some see freedom. AHL: We have been talking about only one of the photographs that Richard Drew, the renowned AP photographer, took of the Falling Man that day. Does seeing the famous photograph of the Falling Man in the context of the other photographs change our understanding of it? HS: If you look at the Falling Man photo in isolation you see a man accepting his fate at some level. He looks calm, he looks composed. The image is full of grace. But if you look at the outtakes you see that he was no different than the other people falling from the sky — arms flailing, legs flailing, clothing pulled by the wind. One could argue that the image is misleading in that he looks so composed. Being aware of the outtakes does change my perception of the image. That’s a good question and oddly enough I’ve never asked it myself. I’m aware on some level that a photograph is misleading but at the same time we have to remember that photographs are just a frame in time. By its very nature the medium is misleading. We don’t know what is happening outside the frame, we don’t know what happened before the frame, we don’t know what happened after the frame. So I carry in my head two feelings about the Falling Man. On the one hand he was no different than the other jumpers on the day but at the same time I hold onto the essential truth that the image represents. AHL: That begs the question: does the camera see more than the photographer? HS: Absolutely. That doesn’t take away from Richard Drew. He deserves all the recognition that he has received for that image. I’m sure that image will join other iconic images from the 20th and early 21st century. It took something like 10 seconds for a body to fall from the towers and Richard was shooting multiple images as the body was coming down. This is not fine art photography where somebody composes a still life. This is instinctive photojournalism — it’s Robert Capa land. And I know from talking to Richard that he didn’t know what an extraordinary image he'd taken until he got back to the newsroom and looked at what he had. So I think you are absolutely right. I think Richard was operating on instinct, like any great photojournalist in a moment of danger and chaos. And it’s the camera that captured that image in all its ambiguity. AHL: Does a photographer have a responsibility for the image beyond the act of taking it? HS: My answer as an interested outsider is that the photographer takes the image and it gets puts out across the wire. It’s ultimately the editors and the photo editors who have that responsibility to publish something like this. I would hate the idea of photographers censoring themselves on site. I saw images of body parts when I was researching the film. Those images were clearly never published and my guess is that most photographers would not have shot that sort of imagery on the day. That would have been one bridge too far for most people. In a way that is the first stage of production and you want them (the photographers) to be the least censored group. Leave it to others further up the food chain to make those decisions in a more reflective way. I’m sure if you talk to Richard Drew or to other war photographers they would say to you that this is the problem with the system — that the photo editors and the editors are so far away from the painful realities of war and things like 9/11 — that the publisher’s office is too close to the editors in terms of the chilling effects of market research and commerce. As the story of the Falling Man reveals, that censorship can creep in. AHL: Should there be a moral or an aesthetic limit to images of atrocity? HS: Yes, I think there should be. This stuff is terribly subjective and everybody draws the line at different places. But to use the example of 9/11 I think drawing the line and not publishing images of body parts on the ground is appropriate. Anybody who was aware of people jumping could have pretty well have guessed what happened. Do we need to see that? No I don’t think so. But do I think that the Falling Man should have been published and should be re-published and that it should be published today? Absolutely. AHL: So in your opinion it was wrong that the image was pulled? HS: The taboo surrounding people who fell from the sky does a great disservice to them and a great disservice to their families. As Tom Junod points in the film these people were swept under the carpet as if they didn’t exist. AHL: Does the disappearance of the jumpers speak to a larger human truth? And what would that be? HS: The image, and the whole notion of the jumpers, was something that people didn’t speak about in the aftermath. Its like how suicide is regarded — you just don’t talk about it. That kind of stigma is painful. The jumpers weren’t acknowledged. And there is nothing worse that not being acknowledged. You asked what the truth of the image is? I don’t know what the truth of the image is. But there is no question that the image forces you to confront the very painful idea of being that high in the sky and having to make that decision. And I think most people, very naturally, don’t want to confront that. And don't miss Tom Junod's follow-up article from Esquire Surviving the Fall: Ten years later, putting the Falling Man to rest. "But I think to really understand the horror of that day you have to include that kind of imagery. Its similar to showing caskets of soldiers who have died in Iraq and Afghanistan. You can’t turn away. The only way we can understand the world — and part of the world is the horror of the world — is to be a witness to these images." And there's no more fitting tribute to those who lost their life than to not turn away. I think the Falling Man may be the artist Michael Richards, who had apparently stayed overnight in his studio space on the 92nd Fl of tower 1. I only learned about him from a piece on the Nat Geo TV channel last night, but as soon as they showed his photo I was struck by the resemblance. Richards had been working with themes of aviation, flight and freedom in his work for a decade, including sculptures cast from his own body, most famously "Tar Baby vs. St. Sebastian" in which his body is pierced by model planes (http://pendulumswing.wordpress.com/2008/09/11/remembering-artist-and-friend-michael-rolando-richards/). It was very eerie to read about Richards work and then revisit Tom Junod's original essay on the falling man: "If he were not falling, he might very well be flying." 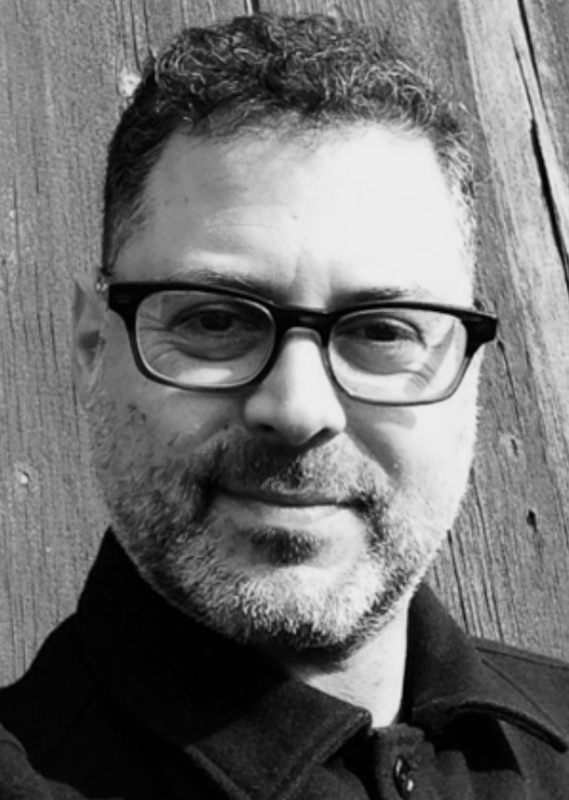 Adam Harrison Levy is a writer and documentary film producer and director. He specializes in the art of the interview. For the BBC he has conducted interviews with a wide range of artists, writers, and actors. He wrote catalogue essays for Hiroshima: Ground Zero 1945 and Saul Leiter: Retrospective. He teaches at the School of Visual Arts and in the Film Studies Department at Wesleyan University. All his work, from cutting the wood during the summer, to stacking it in early fall, through to burning it in the winter freed him from a dependency on oil. His heat is local. It’s late August and your shirt sticks to your back. The only escape is….the beach. In 2005, Adam Harrison Levy interviewed Philip Glass for a BBC documentary film about Chuck Close. Glass was seated in front of the monumental painting Phil. This is their exchange.